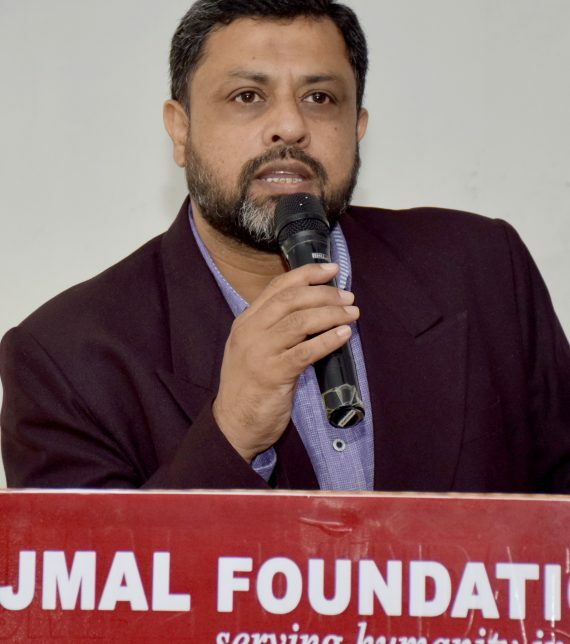 Dr. M. R. H. AZAD is rendering his benevolent services to Ajmal Foundation in the capacity of a Manager. He did M.Sc. in Zoology with specialisation in Animal Physiology from Gauhati University and M.A. in Education from KKHSOU. He obtained his M.Ed. from IGNOU and Doctoral Degree in Bio-technology from Gauhati University. He has got over two decades of experience in Administration, Teaching and Research. He had undergone a number of professional trainings from institutions like Jawaharlal Nehru University, New Delhi, Hamdard University, New Delhi, JNV University, Jodhpur, Rajasthan, Biotech Consortium India, Regional Sophisticated Instrumentation Centre, Shillong and so on. He served various institutions and organisations in the capacities of Hostel Superintendent, Academic Incharge, Research Fellow, Research Associate, Coordinator, Centre Incharge, Principal and Deputy Manager. He showed his acumen in handling independently few National and International Projects and completed them successfully. His works on primates (INDO-US Primate Project), Muga Silk Worm, Antheraea assama (University Grant Commission sponsored Project) and Cancer Chemoprevention (Indian Council of Medical Research sponsored Project) has produced more than 30 research papers and abstracts which got published in International and National Journals of repute. He presented all his research works in different International and National Conferences which were applauded by the concerned authorities. His involvement in Non-scholastic activities and his keen interest to develop scientific models enabled his students to develop scientific temperament and earn recognitions in different National events and Children Science Congresses. His organisation skills are of par excellence and has organised a number of Workshops, Seminars and Conferences for Students, Teachers, Principals and Heads of the organisations. Being inclined towards serving humanity in need, he is actively associated with Ajmal Foundation for last 12 years. He meticulously implements and executes all the Educational, Social, Relief & Rehabilitation, Skill Development and other projects of Ajmal Foundation. He stands firm during any crisis situation and shoots the troubles that comes in way during the course of execution of the projects and schemes of the organisation.